I collected comics from 1988 to 2000. I mostly collected the slightly darker, weirder DC comics, most of which eventually became the Vertigo Comics. “Doom Patrol”, “Shade the Changing Man”, “Sandman” and “Hellblazer” where among my favorites. I never collected the two main Batman titles nor did I hold much interest in the mainstream DC hero titles but when “Legends of the Dark Knight” came out and than later “Shadow of the Bat” I definitely became a Batman convert. Than there where the graphic novels – I wallpapered my first flat with two extra copies of “Arkham Asylum: A Serious House on Serious Earth“. I still have all these comics books and graphic novels today, several thousand of them, and will probably never bring myself to sell them. As soon as I saw that I couldn’t help myself. I had to play with this material and so spent a Saturday messing about and put together a Flash interactive. 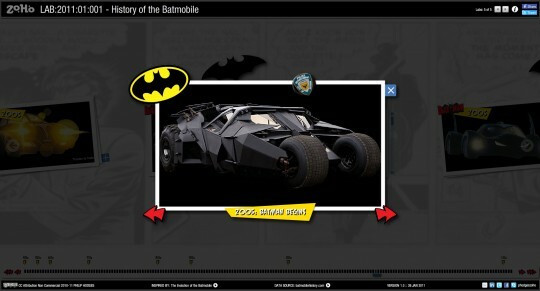 The images for the batmobiles are all displayed in a sliding timeline with pop out descriptions. You can also open a hero view and step through them that way if you prefer. The background is generated from various old black and white Batman Daily comic strips. The various batman logos where taken from the excellent Rodrigo’s Rojas’ “Batman Icon’s Mutations” which you can see on youTube here: I strongly suggest you check it out as he has dates and origins for each of the icons. 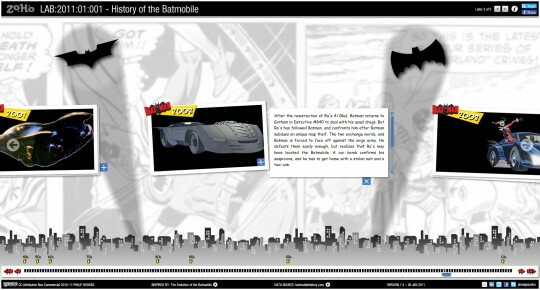 I also strongly recommended you check out the batmobilehistory.com site as well. There is loads of additional information and images up there. Including alternate time-line batmobiles, readers art, as well as toys and collectibles. The owner of the site has obviously put a huge amount of time and effort into putting it all together so definitely check it out. This was loads of fun to do and I hope you enjoy playing with it as much as I did putting it together. 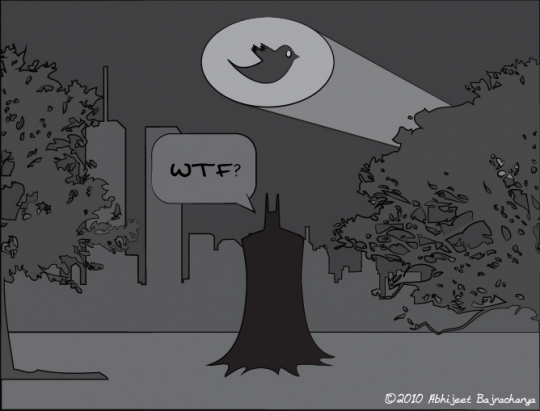 One last thing, when I was searching for the Batman daily strips I came across this image. I have to say it had me rolling around on the floor. I searched around and found the source of it. Abhijeet Bajracharya has a blog and you can view it here. This entry was posted in Actionscript Animation, Data Visualisation, Interactive Data, Lab Examples and tagged Actionscript, adobe, animation, Batman, Batmobile, Data, Data Visualisation, flash, Infographics, Interaction, Interactive, Interactive Data, timeline, UX/UI Design, Visualizations. Bookmark the permalink. Post a comment or leave a trackback: Trackback URL.